1831 - The Prophet Joseph receives Doctrine and Covenants 45. It testifies of Jesus being the advocate with the Father and discusses the salvation of mankind and the events associated with the Second Coming of the Savior. 1832 - The Prophet Joseph receives Doctrine and Covenants 80. It called Stephen Burnett and Eden Smith to serve missions. 1834 - The Prophet Joseph and Parley P. Pratt, accompanied by Freeman Nickerson, started on their journey back to Kirtland, Ohio. They left Brothers Gould and Matthews to prepare the companies that were to travel from that part of New York to Ohio for Zion’s Camp. The three brethren traveled all day and could not find a place to stay the night as the taverns were full. They were obliged to continue riding in the dark and rain until they were able to find shelter at a higher cost than a tavern. 1835 - A meeting was held in Kirtland, Ohio, for the purpose of blessing those who had been assisting in the construction of the Temple. 1840 - Elders Brigham Young and Heber C. Kimball board the ship Patrick Henry in the New York Harbor, leaving the United States for their mission to England as commanded by the Lord in Doctrine and Covenants 118:4. 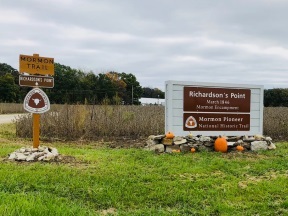 1846 - Brigham Young and his “Camp of Israel” arrive and set up a somewhat permanent encampment at Richardson’s Point, 55 miles west of Nauvoo, Illinois, in Iowa. He ended up staying there until March 19th due to heavy rains making the roads and streams impassable. 1943 - The Navajo-Zuni Mission is organized as the first mission in the twentieth century to Native Americans. 1992 - The United States Internal Revenue Service announces that contributions to the missionary program of the Church are tax deductible as charitable donations. 2002 - The 2002 Paralympic Games opened in Salt Lake City, Utah. The First Presidency participated in the Paralympic torch with Elder James E. Faust passing it to President Thomas S. Monson, who passed it to President Gordon B. Hinckley. President Hinckley raised the torch and said, “We hope this will be a great and marvelous and wonderful occasion for everyone who participates. Let everyone be a winner” (2003 Church Almanac, p. 603). 2003 - The Church receives legal recognition from the government of Benin in West Africa.